Orientalism has been central to the way that people think about the study of the Middle East since in the 1970s Edward Said anatomised it as an attitude. Said was one of the thinkers who emerged in the sixties and seventies and sought to use the work of Michel Foucault to understand US foreign policy. In this sense his project was very much linked to Noam Chomsky's work on the intellectuals in Vietnam. Like Chomsky Said argued that intellectual arguments had become a source of legitimation for American and earlier Western foreign policy- he argued that far from being disinterested observers of the East, that students of the Middle East, of Oriental Studies departments, served as advocates for a policy of imperialism. They did this in two ways- firstly by putting forwards the notion that all Arabs were the same, were uncivilised, prone to irrationality and opposed to the modern world and secondly and more insidiously by making the Arabs a single object, deprived of individuality, an object of study for Western curiosity. Said picked out modern and ancient Orientalists for his criticism, singling out Bernard Lewis as the greatest Orientalist of the moment. Robert Irwin recently has mounted an attack upon Said's theory of Orientalism. Having not read Irwin's book I don't want to summarise his book- my article though is a response to Lawrence Rosen's response to Irwin and Said in the Boston Review. Lawrence Rosen defends the idea that there was something deeply wrong about Orientalism- rather than backing up Said's theory he provides his own template of the mistakes made by orientalists and those who beleive their mythology of the orient. Lawrence Rosen's makes five points about the way that Orientalism fails to present us with a picture of the Middle East. Basically he argues that the Orientalists, caught up in studying the languages of the Middle East, imagined a single Arabic entity floating through the centuries about which they know more than the present day Arabs. Rosen is right- any scholar who assesses the Arab mind- or indeed an Islamic mind- which is timeless is not merely prejudiced but also doesn't understand the history or the Islamic world. To take an argument I've made in another place, the history of India is made up of a series of migrations and influences from other places. The same is true of the Middle East- its a place that has been affected by migrations, by historical change- by the emigration of ideas through the region and also by vast historical changes within the region. But Rosen in his analysis makes two crucial mistakes. Firstly he makes the mistake that Said makes- that is of assuming that all Orientalists are the same- that Orientalism hasn't changed significantly down the centuries. Said is wrong to presume that all Orientalists throughout Europe followed the model of Britain and France, he was also wrong to assume that the major relationship of the West and the Orient has always been an imperial one where the West has tried to conquer the Orient. (The position of Orientalists visa vis politicians is something that I want to come onto in a minute) Rosen makes the same mistake- philology was a popular subject for 19th Century thinkers but held little relevance say for 17th century orientalists for whom theology was the prism through which they understood the Orient. Rosen also makes a mistake in lumping Orientalists together- a political scientist working on the Middle East needs to talk to many Arabs, but a scholar of 7th Century Islam doesn't need to in the same way because of the changes that have occured over the past 1300 years. Said's thesis though was profoundly about politics and the role of intellectuals in politics- Rosen confronts this and then says that Orientalism is disfigured by its scholarly failings as much as its political failings. I want though to turn the spotlight back on what Said argued because it is worth discussing. Firstly Said in his book elided the distinction between works like that I've used as an illustration (a painting by Delacroix) which were popular and populist and the actual scholarship- often the scholars opposed the imperial ambitions and the racist allusions of the more scabrous of the popular works. Secondly Said's intellectuals- like Chomsky's intellectuals- respond only to power. Power and politics Said thinks explain intellectual endeavour. There isn't much time for me to get into this and this is a crude generalisation about Said's theory- but it does leave open the perplexing question as to what power relations Said's work reflects. If all that is happening is that intellectual study is an effort to conquer using the mind, or propagandise, isn't it always a violent endeavour- isn't it always far from innocent and if that's true isn't labelling a particular field violent, violent in itself. The attack thus becomes potentially self defeating and the problem with Said's argument, is that ultimately it isn't enough to say that all intellectuals serve power, the problem is that you have to prove they do in every single instance. The problem is that the field of study has changed over the past five hundred years- as the intellectual contours of the world around have changed. 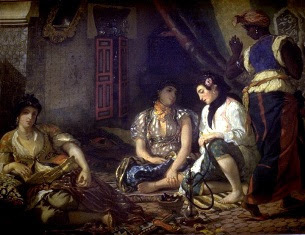 Arguments about Orientalism are useful- because we need to understand what flawed assumptions we bring to the study of other cultures and as the war on terror demonstrates it is not merely interesting but also politically neccessary to study other cultures at this particular point in time and get it right. Said and Rosen offer useful correctives but their books and articles in my view fail to render a complete picture- partly because their picture is too theoretically consistant, and too empirically unsound. Interesting. I can't argue with your view from the point of historical scholarship. Said clearly makes unsupportable generalisations and elides Orientalists over time in unsupported ways. My reservation is that he identified a very real phenomenon, which needs a name (and untutored barbarics like myself often call "Orientalism") which is all too prevalent in the politics of the now. Bernard Lewis was as much the architect of the Iraq invasion as Paul Wolfowitz. What do you wish to call this phenomenon? It's certainly real and has had certainly real political effects. I should add that in economics, there is a "Europeilism" movement in the US descendants of the Chicago school at the moment. They are trying to characterise Europe as a single, "socialist" (in their parlance) entity that needs to be brought to heel. So maybe there needs to be a generic name for the phenomenon? I was thinking about your response for quite a long time- I agree with you that Said was right that a phenomenon exists- though I actually think its more of a general bias against the other- you see it when people write about the past as well- all x had to be y well quite obviously that can't be true all the people you meet today aren't the same so why would they be in the past. I think for the attitudes to the Middle East orientalism is still quite a good word- what I would say is it needs to be used with care. But you're right a generalised word for this attitude needs to be found- I'm still thinking about this one- thanks for a perceptive comment. I am not expert in the field by I do believe that Edward Said’s views are quite accurate. Said was critical to imperialism as well as to imperialism reactions. I do think that the west identity is indissociable to cultural supremacy. We think and we behave as a power. In our mind, the identity of the west would be dissolved if we loose such position. Some historians and philosophs reported awful mistakes and enormities and this from the beginning. Sure, one must not make generalization but what do you expect from Edward Said. The attitudes were and still are wrong. On should remember when Jews and Muslims were expelled from Spain, all oriental and non-Christian sources were expelled from the European civilization. “Limpieza de sangre” Blood Purity!!! Christianity and race gave legitimacy to the conquest of America. Then followed “antinegro” statements to legitimate slavery. Scientific theories took place of religion and argue that blacks are inferiors to white (18th century). This satisfied power appetite and defense of west interests. I jump over the colonialism period where the colonized were supposed to be ungrateful and deprived of maturity. And now, the barbarian is the Muslim. Bush did not “find” it by himself.